A TRUE SENSE OF ACCOMPLISHMENT! When is the best time to climb Mt. Kili? While possible to climb it year round, January, February, September and even October are considered the best months in terms of weather; however, also the busiest months. June, July and August are also good months but generally colder. April and May is the longest rainy season with heavy clouds and less visibility. November and December have less rain with brief afternoon showers with more clear skies in afternoon and evenings. 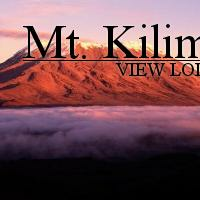 "Kili" is very special for many reasons: "The Roof of Africa" is best known as the highest mountain in Africa. However, it also is both the largest and tallest free-standing mountain in the world and the very top is the closest place on the entire earth to the sun! This is due to its location-- only 200 miles or 5 degrees below the Equator. But what truly separates "Kili" from the "Big Seven," the highest peaks on each of the seven continents, is its popularity with climbers. At 19,710 feet (5895m) the biggest challenge is AMS--Acute Mountain Sickness or commonly referred to as simply Altitude Sickness. Anyone over the age of 10 can hike to the summit so long as they are in reasonably good physical shape. Because it is a non-technical climb, it has become an "in thing" for people into their 80's from all parts of the world to put their physical fitness to the test. Currently, 40,000 climbers a year attempt to summit Mt. Kili with 80% success. Usually coming from a much lower alititude, acclimatizing at MKVL at 9,600 ' for a couple days before a climb increases ones odd of reaching the top without incurring alitude sickness. Park authorities require that all trekkers arrange their walk through a licensed agency and that they be accompanied throughout their walk by a guide. Our experienced guides know the different routes and their level of difficulty to assist you in making the right choice---five or six day program to reach the summit or a weekend trip to a "half-way" point? Stay in huts along the way or camp in tents are some of the decisions that have to be made in advance? Questions like what to bring your best value, weather conditions, costs can be answered. You can climb Mount Kilimanjaro through different approved routes ranging from Marangu, Umbwe, Machame, Rongai to the Lemosho route. The Lodge can conveniently arrange everything: 1) Make Park Reservations and pay required permit fees. 2) Assemble a highly qualified guide/porter team which sometimes includes a cook. 3) Make certain you have all the necessary medical and climbing gear. 4) Provide transportation to and from the Marangu Gate or any of the other designated routes. please refer to Lonely Planet's publications on the subject. 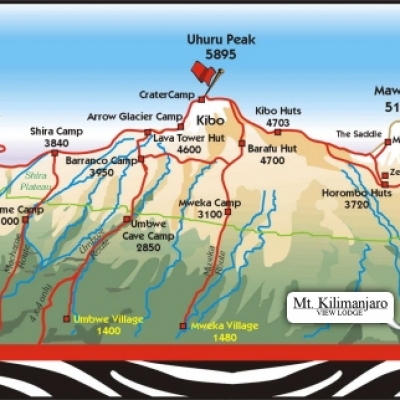 The main tourist route and by far the most popular, some claim that this is the easiest route to Uhuru Peak. The 5-day option which is available on this route makes it the least expensive route on the mountain. A 6-day option with an extra day of acclimatization is also available. This is the only route which provides comfortable sleeping huts, equipped with beds and mattresses at every camp site. Mineral water, soft drinks, beer and chocolates are also sold at every camp. All the camps on this route have radio contact with the Park Headquarters. Early morning transportation will be provided from Mount Kilimanjaro View Lodge to the trailhead of your selected route. Arrangements will be made to return you to the lodge to celebrate. Many choose the hot massage jacuzzi and some spirits to watch the setting sun illuminate the mountain they have just climbed. It cannot get much better!! 1. Leave mid-morning starting at the main gate and walking through the rain forest to Mandara Hut (2743m), about 1 hour. Usually acclimatize at each overnite camp before going to bed. 2. 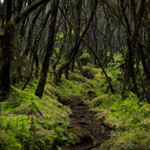 Leave the forest and cross open moorland to Horombo Hut (3760m). 3. 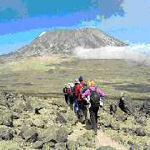 Walk through moorland and alpine desert to "The Saddle" between the peaks of Mawenzi and Kibo. From here, walk for about an hour to reach Kibo Hut (4730m). 4. Very early start to the summit on steep scree up to Gillman's Point (5681m) which is on the crater rim. Continue around the rim (which will take about 2 hours if you are fit) to Uhuru Peak (5895m), the highest point in Africa. Descend to Kibo Hut for tea and biscuits or soup and then down to the thicker air and the relative warmth of Horombo Hut. 5. Descend to Marangu Gate where our driver will be waiting to take you back to the lodge. This route is one of the shorter but also one of the more difficult routes to reach Uhuru peak - but quite spectacular. Umbwe is known for its caves. The first night you actually sleep at the Umbwe Cave Camp. There are two more caves that can be visited on route the following day. Umbwe is also sometimes used as a descending route. 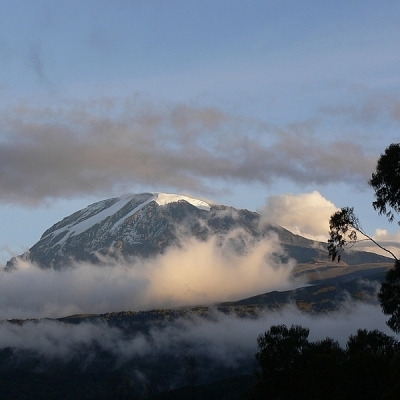 The Shira Plateau is one of the most scenic and most fascinating areas on Kilimanjaro. Depending on the weather conditions you can drive by 4 wheel drive vehicles, to within a 1 to 2 hours walk of Shira Hut (4000m). Even this drive is spectacular and offers some magnificent views of Mt Meru and the Great Rift Valley in general. Game is often sighted and the road features some striking vegetation changes ranging from forest, grassland, heath to moorland. The fast ascent by vehicle to about 4000m will require additional acclimatization, after which it will be possible to ascend Uhuru Peak either via the Western Breach or via the Barafu hut. 1. Early morning drive from Moshi to the Umbwe Roadhead at 1800m. The route initially follows a forestry track winding up through the natural rain forest. It then narrows and steepens to climb the ridge between the Lonzo and Umbwe rivers. The first campsite is in the forest by some rock overhangs (2940m, 5-6 hrs walk). 2. Shortly after leaving the camp the forest ends and the path continues along a narrow spectacular ridge. Above, the sheer 1000m of the Breach Wall appears and disappears as the afternoon mists roll up the Great Barranco. From the Umbwe ridge the route descends slightly to the Barranco hut and your campsite in the valley floor (3900m, 5-6 hrs).3. A short scramble to the top of Great Barranco and then a traverse over scree and ridges to the Karanga Valley (4000m, 3 hrs), beneath the icefalls of the Heim, Kersten and Decken Glaciers. After climbing out of the Karanga Valley the trail ascends a ridge to Barafu Camp, an area of little vegetation (4600m, 3 hrs). 4. An early start for the ascent to the rim of the Kibo Crater between the Rebmann and Ratzel Glaciers (4 hours). The last section before the rim can sometimes be snow-covered and an ice axe or ski stick is useful for balance. From here a further hour leads to Uhuru Peak, from where there are often fine views of Mt. Meru to the west and the jagged peak of Mawenzi to the east. After a short time on the summit you descend to the Barafu hut for a rest and lunch before continuing on down to camp at Mweka hut in the giant heather zone on the Mweka route. Those of you with enough energy on the summit might wish to descend to the Reutsh Crater and visit the dramatic ice pinnacles of the Eastern Icefields. 5. A 3-4 hour descent through beautiful forest brings you to the Park Gate where our driver will be waiting to drive you back to the lodge. 1. Departure from MKVL and Moshi in the early morning and drive to Machame Gate. 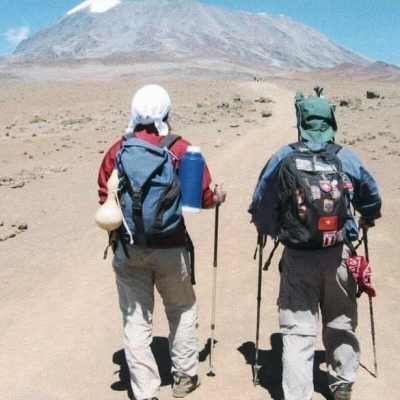 Walk through shambas and then forest to Machame Campsite (3000m, about 6 hrs)..
2. Continue along the steep ridge going on to rock ridges and through heather. The route turns west into a river gorge, reaching Shira Campsite (3800m, 5 hrs). 3. Continue east towards Kibo, passing the junction, then east towards the Lava Tower. Shortly after this you descend to Barranco Campsite (3940m, 4 hrs). 4. A short scramble to the top of the Great Barranco and then a traverse over scree and ridges to the Karanga Valley (4000m, 3 hrs), beneath the icefalls of the Heim, Kersten and Decken Glaciers. After climbing out of the Karanga Valley the route ascends a ridge to the Baraful Campsite, an area with little vegetation (4600m, 3 hrs). 5. An early start for the ascent to the rim of Kibo Crater between the Rebmann and Ratzel Glaciers (4 hrs); the last section before the rim can sometimes be snow-covered and an ice axe or ski stick is useful for balance. From here a further hour leads to Uhuru Peak from where there are often fine views of Meru to the west and the jagged peak of Mawenzi to the east. Descend to Barafu for a rest and lunch before continuing on down to camp at Mweka in the giant heather zone on the forest edge. You may wish (your energy permitting!) to descend to the Reutsh Crater and visit the dramatic ice pinnacles of the Eastern Icefields. 6. A 3-4 hour descent through beautiful forest brings you to the Park Gate where our driver will be waiting to take you back to the lodge. 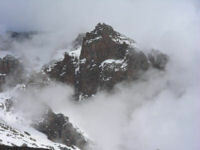 The Rongai Route approaches the highest mountain in Africa from the north. The easiest of all the routes, it has a relatively gentle gradient, and short daily stages as it winds its way from the starting point just south of the Kenya-Tanzania border. It passes through farmland and forest, past Alpine moorland to the beautiful summit cone. There are magnificent views throughout, with possibilities for wildlife viewing, and an extra day to aid acclimatisation as the trails climbs beneath the towering spires of Mawenzi. 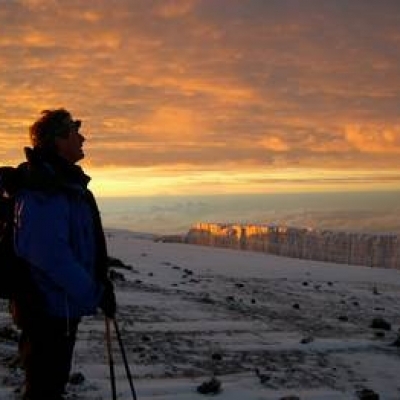 The final ascent is arduous and made in darkness, but the reward is a spectacular dawn view of the glaciers and ice cliffs of the summit, and across the East African plains far below. Descending through lush forest, there is time to relax and recover before the flight/your next safari destination. 2. Begin ascent of Kilimanjaro through Rongai Forest (2600m). 3. Climb to Kikelewa moorland (3600m). 4. Steady ascent beneath jagged peaks of Mawenzi (4330m); afternoon acclimatisation. 5. Cross lunar desert of the 'Saddle' to Kibo, at the bottom of summit cone (4750m). 6. Early start to reach Gillman's Point in time for sunrise over the crater rim: on to Uhuru Peak, the highest point in Africa (5895m). Descend to Horombo (3720m). 7. Continue descent through forest to Mandara and Marangu. 8. End Marangu at gate where our driver will be waiting to take you back to the lodge. 1. Early morning drive to the gate of Londorosi. The 4WD will take you further up to Lemosho glades, thereafter you can walk for about 4hrs to Mti Mkubwa Campsite (9,200ft) Dinner and overnight at the camp, B.L.D. 2. Breakfast, leave the Mti Mkubwa campsite for Shira plateau (11,550ft), walking through the moorland steepening track. Dinner and overnight at the Shira I Camp, B.L.D. 3. Breakfast, hike across the high desert to Shira II camp (12,220ft) with significant acclimatization effect as we go up the mountain. B, L, D.
4. After breakfast, leave Shira II for Baranco Camp (13,100ft). Pass through the last water drop at Karanga valley on the way up. Overnight Baranco Camp, B, L, D.
5. After breakfast, leave Baranco Camp for Barafu Camp (14,910ft). Pass through the last water drop at Karanga valley on the way up. Overnight Barafu Camp, B, L, D.
6. 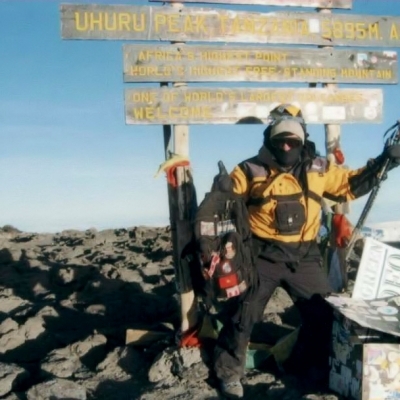 Wake up at midnight, and after a small snack, start ascending to Uhuru Peak through the Stella point (18,640ft). 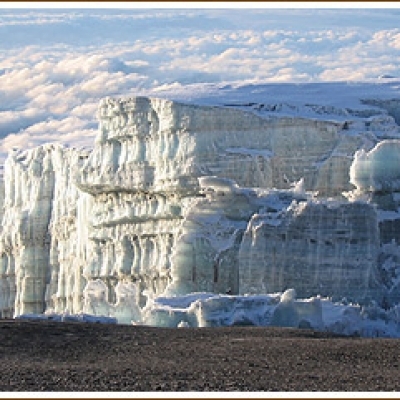 Ater reaching the summit, head down to Mweka Camp (10,100ft) for dinner and overnight, B, L, D.
7. After breakfast, head down to Mweka gate with lunch packet, and the waiting vehicle will take you back to the lodge. 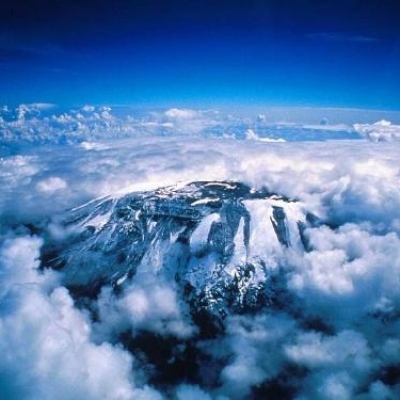 The second highest mountain in Tanzania at 4,566m or 15,220 feet, Mt. Meru, in nearby Arusha National Park, can be a good alternative for the hardy trekker not needing to climb the much better known Mt. Kilimanjaro. Its volcanic cone offers the individual one of East Africa's most rewarding and scenic climbs. A Travel Guide Book or search on the Internet can give you detailed information. Please book online now and feel free to ask any questions. A Google.com search can probably answer many of your questions.